Draw a cat! Cats are fun to draw, and certainly people pleasing art. It’s a win/win! When I was working in the LaGuardia Airport branch of the Metropolitan Museum of Art Gift Shop, we had a display of cat items. Notepads, notecard, notebooks, everything of note. A customer came in, said she hated cats, why not a set of dog items. We didn’t have a set of dog items. This past Christmas, I was selling pajamas with a golden retriever in the pattern. A woman looked at them, and said no, she had a dachshund. As if the dachshund would get jealous! For most cat lovers, a cat is a cat is a cat. But dog lovers are loyal to breeds, I think. Unless someone wants to do pictures of all the various breeds of dogs, well, the market for dog items is qualified by the customer’s preference. 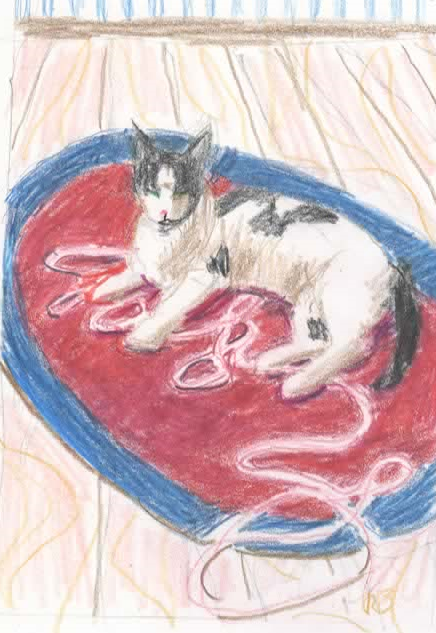 So, here’s a sketch of “String Theory, According to Cats”. Previous PostI Need a HobbyNext PostWhat the Heck!